Over the past two years OLPRO have been designing an exciting range of inflatable campervan awnings - the OLPRO Breeze range. Camping folks have enjoyed the ease of inflatable tents for a few years, and now campervan owners don't have to miss out any longer! The five freestanding awnings (3 designs, 2 colour options) fit campervans upto 235cm high. Because they use air filled beams as opposed to fibre glass poles the BREEZE awnings take from just five minutes to inflate!! Simply Unpack, Pump Up and Peg Out ... Easy Breezy. Each campervan awning comes with EVERYTHING you need, a complete freestanding awning with sewn in groundsheet and built in inflatable beams. They come in holdhall style bags with pegs, extra reinforcer poles, and storm straps, so you have nothing more to buy. Would you take one when away camping? Why not let us know what you think of this brand new range of inflatable campervan awnings. We have teamed up with OLPRO and are offering you the chance to win one of these fantastic CUBO Breeze Inflatable Awning worth £349! 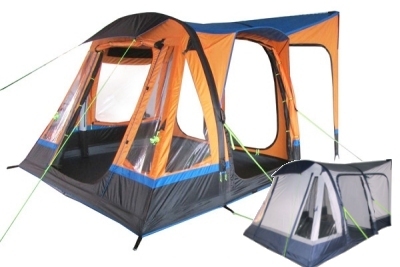 UKCampsite.co.uk Special Offers - HUGE DISCOUNTS! UKCampsite.co.uk visitors can now order the Breeze Range from OLPRO, get a HUGE discount with our exclusive code, and have the product delivered to you in late October! To claim your discount, just visit their website, make your purchase, and enter the discount code UKCAMPSITE at the checkout! CUBO Breeze RRP £349 - Save £80 - Discount price only £269.10 ! LOOPO Breeze RRP £499 - Save £90 - Discount price only £359.10 ! COCOON Breeze RRP £699 - Save £160 - Discount price only £539.10 ! Gallery Images: 2 Thanks for showing these in great detail. We have a van which is higher than these products will reach. I am sure that Olpro will be on the case of height for next year. They do seem to be just the ticket, and the 2 colours are interesting and give choice. We have 2 Vango Tall awnings. One larger than the other. They both take only minutes to erect. Gallery Images: 3 Black Friday Special Discount Code - Ignore the code above, from now until midnight 29th November, we have secured a new Black Friday discount code UKCAMPSITEFRIDAY. This will bring the price down even further! Save up to £220 !! Congratulations on your recent win with us and the prize will be sent to you in due course.